Super-fast internet delivered via beams of light instead of crowded wi-fi signals could revolutionise how Londoners get online, its inventor said today. Li-Fi uses ordinary LED lights to transmit data wirelessly around the home, but Professor Harald Haas said it would be possible to harness the power of the video billboards at Piccadilly Circus and turn them into a giant router. The speed of the new technology would vary between one and 100 megabits per second and Professor Haas said the highest speed would enable an HD movie to be downloaded “in a few seconds”. The system works by fixing a microchip to a LED lightbulb, causing it to flicker millions of times a second. This creates a rapid stream of binary code, invisible to the human eye, which feeds into an web provider to bring users online via a dongle attached to their computer. 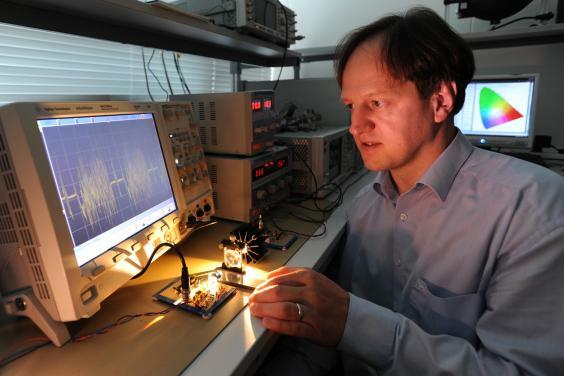 Professor Haas said Li-Fi could provide internet speeds many times faster than currently received because of the multitude of light sources in London, including street lamps and even car headlights. He said it could revolutionise internet access for Tube passengers who would be able to get online even in tunnels, because of the light source in carriages. Li-Fi is also said to be more secure because light cannot travel through walls. Professor Haas said: “In London, the problem is there are too many people in a too confined space and everyone wants a share of the bandwidth, which is very limited. We have lights on the Tube and in shopping malls and all these lights could provide 10,000 times more capacity than we have with wi-fi. It’s a matter of using a big resource that is free for data communication. In a TED talk, Professor Haas, chairman of mobile communications at the University of Edinburgh, demonstrated how HD video could be streamed via a desk lamp, but cut off when a hand is placed across the light stream. He said Li-Fi would play a key part in the powering the internet of things, connecting appliances to the internet, and could even cut energy bills. This entry was posted in Technology, WiFi and tagged internet access, Li-Fi, technology on November 27, 2015 by Tim Cosgrove. “HoloLens offers the freedom to create a bespoke experience which customers can steer themselves. Imagine using mixed reality to choose the type of car you want – to explore the colours, rims, or get a better understanding of the features, services and options available,” said Björn Annwall, Senior Vice President, Marketing, Sales and Service at Volvo Cars. This entry was posted in Connected Cars and tagged Connected Cars, hololens, microsoft, technology, volvo on November 23, 2015 by Tim Cosgrove. Apple has issued a statement in the Wall Street journal criticizing a study conducted by the University of Utah for the American Automobile Association in October that rated Apple’s Siri (and other naturalistic voice-command virtual assistants by proxy) as “the most” distracting in-car task compared to just driving, adjusting the car’s radio or temperature, or using built-in car navigation or infotainment systems. In its response, Apple points out some serious flaws in the study, including the fact that it deliberately avoided using the driving-specific Siri Eyes Free or CarPlay options. The study rated driver tasks that used built-in systems such as adjusting the radio, but compared voice systems by having drivers hold the smartphone and use the phone’s native voice assistant (Siri was the only tested system of this nature, but was intended as a “stand-in” for others like Microsoft’s Cortana on Windows 8 phones). The method used to test only voice-assistant smartphone use is patently illegal in many states, and ignored any built-in car integration with Siri or other systems. The revelation would seem to confirm early criticism of the study that AAA’s Foundation for Traffic Safety, which paid for the study, has a long history of being opposed to any form of driver distraction at all, going back to the introduction of car audio systems — and that it deliberately slanted the latest study to ignore the safety recommendations of voice-assistant makers like Apple and paint the technology in the worst possible light. Apple’s statement did not challenge, however, the overall conclusion found in a number of studies that natural-voice systems can be distracting. Because Cortana, Google Now, Siri and other natural-voice programs can often misunderstand drivers and be difficult to correct, the more primitive limited-voice command systems can actually be more reliable, though they generally have a far more limited range of abilities. That said, studies outside the AAA one found that voice command of infotainment systems is generally safer than operating controls manually — the opposite of the AAA study. Anything other than silent concentration on driving alone — even just listening to music — is considered more distracting, but the issue becomes a question of degree. While there is little disagreement that voice-control assistants could be and likely will be made more reliable going forward, the AAA FTS study appears to be nearly worthless, since it did not test voice assistants when they are integrated into the car’s existing systems — a factor that could make a major difference on how distracting the system is. This entry was posted in In-Car and tagged apple, hands-free., in-car, Siri, technology on December 1, 2014 by Tim Cosgrove. SK Telecom (NYSE:SKM) today announced that the company will implement an IoT (Internet of Things)-based fish farm management system (hereinafter, the management system) at an eel farm in Gochang, North Jeolla Province, and start a pilot operation for system validation on September 1. SK Telecom, together with BD Inc., is developing the management system which will improve the current farm management process with the help of IoT technologies based on wireless sensor networks and enable farmers to remotely monitor their fish tanks in real-time through smart devices including smartphone. In general, each eel farm has twenty to sixty water tanks, each measuring 6m in diameter. Eel farming is a high value-added business, but the farming requires farmers to arrange human resources to manually observe several indicators of each tank all the time including water temperature, dissolved oxygen and pH (every two hours and six hours for the young fish and grown ones respectively) as even minor changes in the environment such as a sudden temperature change, oxygen deficiency or water pollution are fatal to eels. Under the IoT-based fish farm management system, three sensors are installed on each fish tank to measure water temperature, quality and oxygen level. Then, a water quality monitoring equipment will digitize and display the data from the sensors and send them to ‘SUN (Smart Utility Network)’, a new near field communications technology, so that Gateway can collect and transmit them using LTE networks to Mobius, an open ‘IoT’ platform of SK Telecom. Mobius will then send the data again to a fish tank management server for analysis and finally the users can check the tank status on the smartphones. The data flow through IoT Gateway to SK Telecom’s open IoT platform which will then analyze the data and send status check results to the farmers’ smartphones in real-time. If any abnormality is found, even in the middle of the night, the management system sends alarm messages to the farmers on their smartphones so that they can swiftly respond, thereby ensuring stable and efficient farm management. In addition, when the user inputs data such as the volume of feed or shipment, the system makes analysis of the data to provide meaningful statistics and comprehensive information on the fish growth. Providing the real-time monitoring feature and optimal information on fish farming, the management system is expected to enhance productivity of farming business while bringing revolutionary change to the farm management process by enabling farmers to manage risk factors simply with their smartphones. Meanwhile, the smart farm management project is partly funded by the government as it was selected as a public-private partnership technology project by SMBA (Small and Medium Business Administration) last July. SK Telecom aims to commercialize the IoT-based fish farm management system in the first half of next year. After applying the system to about 450 eel farms across the nation, the company plans to expand the project to different species of fish. Also, SK Telecom plans to enter overseas markets including Japan and China with this project based on its know-how and knowledge earned in Korea. In particular, a set of technologies used to implement the smart fish farm can also be widely applied to agriculture and livestock farming. Choi Jin-Sung, Executive Vice President and Head of ICT R&D Division at SK Telecom, said, “In a new era where all things are digitally connected, ICT, including IoT, can raise productivity and bring innovation to traditional industries. SK Telecom is committed to using the company’s leading technological edge to enhance national competitiveness and revitalize local economies”. This entry was posted in IoT and tagged IoT, SK Telecom, technology on September 23, 2014 by Tim Cosgrove. Google has bought a biotech company that has developed a spoon designed to make life easier for people with diseases such as Parkinson’s. Latest acquisition Lift Labs will join Google’s research division Google X. The firms announced the deal on the search giant’s social network Google+ but did not reveal the financial terms. “Today we’re welcoming the Lift Labs team into Google X. Their tremor-cancelling device could improve quality of life for millions of people,” said Google. And in July it announced an ambitious science project – Basline Study – to collect anonymous genetic and molecular information to create a picture of what a healthy human should be like. For co-founder Sergey Brin the move into healthcare is a personal one. His mother developed Parkinson’s and, after gene testing, he found that he has a higher than average chance of getting the disease. Meanwhile his fellow co-founder Larry Page, who suffers from a rare vocal cords problem, is interested in how big data can help solve some of the world’s most problematic diseases. He has made public his hope that people would overcome privacy fears to make their medical records available to researchers. Google’s semi-secret research facility Google X was set up to work on cutting-edge technology. Other projects include Google’s driverless car, balloons to deliver broadband and Google Glass. This entry was posted in Technology and tagged Google, health, Larry Page, Sergey Brin, technology on September 12, 2014 by Tim Cosgrove. French company Netatmo has developed a bracelet designed to protect you from the sun. It is not sold in traditional jewellery shops – instead they are selling it through Apple Stores, and online. The June device communicates via Bluetooth with your mobile device, to give alerts about how much sun you are being exposed to. The BBC’s Dougal Shaw tried out the device during one of the hottest days in July (the 18th) in the UK – and kept a video diary. He also met up with Raphaelle Raymond of Netatmo to quiz her about the device. This entry was posted in Mobile Devices and tagged app, bluetooth, smartphone, technology on July 30, 2014 by Tim Cosgrove. The UK is to encourage the development of driverless cars on its roads, it was announced on Wednesday, with a multimillion-pound research fund and a review into the relevant laws around road safety. The business secretary, Vince Cable, said a £10m fund will be made available for driverless car researchers in the UK, joint funded by the Department for Business, Innovation and Skills (Bis) and the Department for Transport (DfT). The DfT will also kick off a review process of the laws governing road use, including the Highway Code and the Road Safety Act, to permit the testing of driverless cars on public roads, Cable said while visiting the technology and engineering company Mira in Nuneaton. Two types of testing will be reviewed for public roads: fully autonomous cars without a driver, and those with a qualified driver who could take control at any time, similar to laws in the US where driverless cars have been tested on public roads since 2011 in some states. The review process will conclude in a report submitted to government by the end of 2014, a spokesperson for DfT told the Guardian. The £10m fund will be governed by the UK’s innovation agency the Technology Strategy Board. Interested local research institutions will be able to apply for funding by submitting a business case paired with a local city or authority as to why driverless cars are a viable transport solution in their area. Three cities across the UK will be selected to host driverless car trials from next year, with each test to last between 18 and 36 months starting in January 2015. The deadline for driverless car research applications will be 1 October. The fund was first announced by the chancellor, George Osborne, in December as part of the national infrastructure plan. Google’s driverless cars hit headlines and the public consciousness in May, when the search giant announced a brand new bespoke prototype design. The UK has various groups already working on driverless car technology, including engineers at the University of Oxford and engineering firm Mira, which provides autonomous vehicle technology to the military and has been testing driverless cars on a 850 acre site in the Midlands. “Today’s announcement takes us closer to seeing fully autonomous vehicles on our roads but it will take some time for them to become commonplace,” said Edmund King president of the AA. “Cars are becoming more automated with the introduction of assistance systems to aid parking; keeping a safe distance from the car in front; or lane departure warning systems,” said David Bruce, director of AA Cars. “However, there is a big leap of faith needed by drivers from embracing assistance systems to accepting the fully automated car. Two-thirds of AA members still enjoy driving too much to want a fully automated car,” Bruce said. “Driverless cars have huge potential to transform the UK’s transport network – they could improve safety, reduce congestion and lower emissions, particularly CO2,” said the transport minister, Claire Perry, who committed to the regulatory review of road law. Driverless cars are expected to begin being tested on public roads in 2015, although the DfT could not provide a timescale beyond report submission to the government by the end of 2014. “This competition for funding has the potential to establish the UK as the global hub for the development and testing of driverless vehicles in real-world urban environments, helping to deepen our understanding of the impact on road users and wider society,” said Iain Gray, chief executive of the Technology Strategy Board. “The ability to test driverless cars at scale, when married to the UK’s unique strengths in transport technologies and urban planning, will also attract further investment, helping to establish new design and manufacturing supply chains, driving forward UK economic growth,” Gray said. Dr Geoff Davis, chief commercial and technical officer of Mira said he welcomed the news. “Our 10 years of experience developing driverless car solutions with successful applications in defence and security as well as cooperative systems in road transport applications means we are already working on a number of projects that explore the potential of connected and cooperative driverless cars,” Davis said. This entry was posted in In-Car, Technology and tagged car, Driverless, Google, technology, Vince Cable on July 30, 2014 by Tim Cosgrove. Cutting-edge technology is being pioneered by researchers at Jaguar Land Rover to develop a truly intelligent self-learning vehicle that will offer a completely personalised driving experience and help prevent accidents by reducing driver distraction. Using the latest machine learning and artificial intelligence techniques, Jaguar Land Rover’s self-learning car will offer a comprehensive array of services to the driver, courtesy of a new learning algorithm that recognises who is in the car and learns their preferences and driving style. The software then applies this learning by using a range of variables including your calendar, the time of day, traffic conditions and the weather to predict driver behaviour and take over many of the daily driving ‘chores’, allowing the driver to concentrate on the road ahead. Fuel Assist – suggests fuel stations which have the driver’s preferred brand and location, based on historical usage. The car will let you know if you have enough fuel before long journeys the day before you travel. Auto Adaptive Cruise Control (ACC) – when AACC is activated, the car applies the distance setting and acceleration profile it has learned when the driver is driving the vehicle. This entry was posted in In-Car, Technology and tagged in-car, jaguar, land rover, self-learning, technology on July 14, 2014 by Tim Cosgrove. What if present day football embraced m2m? Today there are many companies that are applying M2M technology to sports. This infographic shows what would happen if their innovations and devices, based on machine to machine communications, the Internet of Things and Big Data, were exploited in football today. This entry was posted in M2M (machine-to-machine), Technology and tagged football, M2M, technology, telefonica on July 2, 2014 by Tim Cosgrove. With a smartphone in almost every pocket and e-bicycles constantly getting better, it was only a matter of time when the two would start working together. Visiobike, an e-bike project from Croatia is an electric bike that goes hand-in-hand with your smartphone. You can use the phone to unlock the bike, track your speed or even see what’s behind you using the built-in rear camera. We had a chance to go hands-on with a late Visiobike prototype, and we were impressed with the amount of details and thought put into the project. The smartphone (both Android and iPhone are supported) has a dedicated cradle on the bike’s handlebar, but it connects to the bike wirelessly, via Bluetooth. You can see a GPS map of your surroundings or statistics about your ride on the phone, with all your data being stored in the cloud. Another important feature is automatic accident recording and emergency alert if Visiobike detects an impact. And on the security front, the Visiobike has GPS tracking and a motion sensor with SMS notification, so that you know what’s happening with your bike at all times. We’ve seen e-bike-smartphone integration before — the Gi bike has done something similar, but with its folding design, it’s a very different bicycle. The Visiobike doesn’t fold and has a much more sporty look: with a carbon fiber body, huge 180mm/160mm hydraulic disc brakes and a SR Suntour fork, it looks like a slightly bulkier mountain bike. It weighs 46.3 pounds, which one of the project’s founders Marko Matenda calls the ideal weight. “It provides for a great motor and a hefty-enough battery, but it’s light enough that you can carry it up a flight of stairs,” he says. While we could manage a couple of floors, be warned: 46 pounds is much heavier than a regular mountain bike and carrying the Visiobike any higher than a few stairs might be an issue for some users. For comparison, the aforementioned Gi bike weighs 37.4 pounds, while Rimac Automobili’s Greyp G 12 e-bike — also a Croatian project — weighs 108 pounds, but it makes up for the extra weight with a lot of power, top speed being 40 mph. Visiobike is available with two different motors, one providing 250W and the other 500W of power, with top speed being either 15.5 mph or 31.1 mph. However, it’s not a bike that drives itself; instead, it’s a pedelec, meaning the motor merely assists you when you need power. You simply hop on the bike and start pedaling as you would with a standard bike. Start climbing up a hill, and it will feel pretty much the same, as the bike’s motor supplies the extra power. We’ve tried the Visiobike with an automatic transmission, meaning you don’t have to worry about gears — you merely set how much help you want to get from the motor and start riding. The lithium-ion, 14.5Ah battery lasts for around 62 miles, after which you’ll need to plug the bike into a regular outlet and recharge it for three hours. With all these options and variants, saying how much the Visiobike costs is not that simple. The basic version with the weaker motor costs $5,318, while the best possible variant (automatic transmission and the rear camera included) will set you back $6,749. This entry was posted in Mobile Devices, Technology and tagged android, apple, bike, croatia, GPS, technology, visiobike on June 6, 2014 by Tim Cosgrove.